"The 'afternoon sea' glows in the warmth of the sinking sun." Artist comment: "This oil painting on canvas is based on the many experiences I had visiting the Pacific Northwest Coast of Washington and Oregon. Although often a cloud bank forms out over the sea, when the sky lights up with glorious color. It is a spectacular scene. I painted this from memory using my knowledge of color to work the warms and cools in perfect harmony. Starting with the dark upper clouds, I painted the blues throughout the entire piece, followed by the oranges and finally, the lightest yellows." "Afternoon Sea" is a 30" X 33" oil painting on stretched canvas. 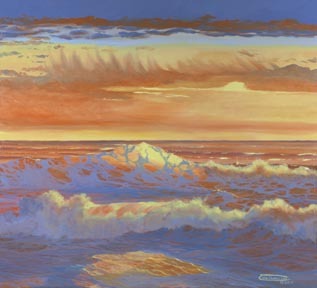 "Afternoon Sea" is a limited edition, giclée print from an original oil painting by Carol Thompson. The edition includes 3600 authorized, signed, limited edition prints (3500 numbered and 100 artist proofs). Release date is September 2011. Image size and substrates vary. All prints are signed and numbered by the artist and include a certificate of authenticity. Paper prints are shrink wrapped on foam board. Canvas prints are coated with a protective spray.